Create a Protect My Ministry account. Visit the Protect My Ministry website to create an account or contact your existing representative to notify them of the move to Arena. 1. From the Administration menu, click the Background Check Configuration option located under the ADMIN heading. 2. Click the Add New Background Check Provider icon. 5. 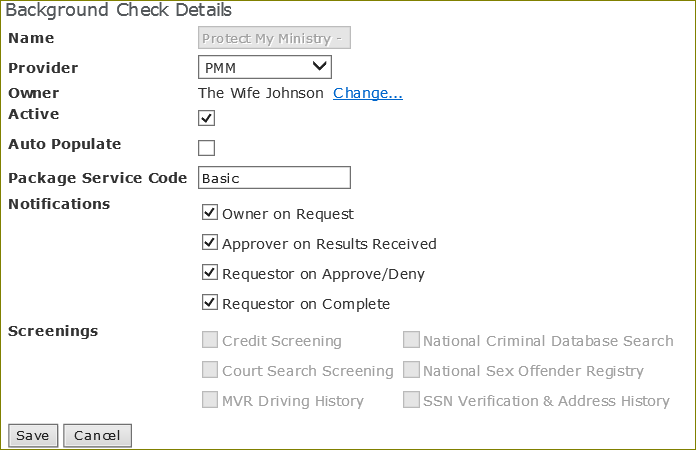 Verify and customize Background Check Types in Administration. Arena includes a Basic and Plus background check type. Click the Add New Background Check Type icon to add a background check type. 6. 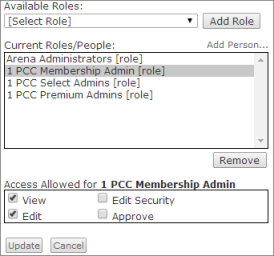 From the Administration menu, click the Background Check Types option located under the CONFIGURE heading. 7. Click the Edit icon on the far right of the Type you want to customize. 8. Click the Change link to search and select an existing record as the owner. The current user is the default owner. •Active: Select this check box for the background type to be active. •Auto Populate: Select this check box to allow the background check eform to auto populate the person’s information on the new background check page. •Package Service Code: Use this field to name the background check type. •Notifications: Select the email notifications for this background check type. Also start correlating Agents to customize correlating System Emails. •Owner on Request: Select this check box if you want Arena to email the background check type owner when a staff member creates a request. •Approver on Results Received: Select this check box if you want Arena to send an email to the approver when individual reports are available for review. •Requestor on Approve/Deny: Select this check box if you want Arena to send an email to the requestor when the background check request is approved or denied. •Requestor on Complete: Select this check box if you want Arena to send an email to the requestor when the background check is done. •Screenings: For non-default screenings, select or deselect screenings as desired. 9. Click the Save button. 10. Set security for each Background Check Type. 11. Click the Security icon for the Background Check Type. 12. Set security for the Background Check Types. •View:This permission allows users to view requests for this background check type. •Edit: This permission allows users to edit requests, including initial requests, for this background type. •Edit Security: This permission allows users permission to edit security for the background check type. •Approve: This permission allows users to approve background check requests. 13. Set security for the New Background Check and Background Check pages and modules on the Pages/Modules tab of the Security Role(s). 14. 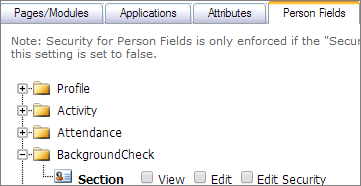 Set security for the Background Check section on the Person Detail page. 15. Refresh Cache and test.